Designed to be the "jack of all trades", the 2018 Cabrinha Switchblade continues it's legacy of being one of the world's most popular kites. Brought back to the lineup for 2018, the XO Switchblade is the same as the regular switchblade, with a bit more of a feminine approach on the graphic. Unlike other all-around freeride kites, the Switchblade often surpasses the capabilities of style-specific kites - freestyle, surf, wakestyle, etc. The Switchblade is capable of helping a total beginner get their first rides in, stable enough to jump off a massive tower, or even winning the Red Bull King of the Air (via Nick Jacobsen). For a female rider who wants unrivaled predictability, unmatched versatility and uncompromising high end performance and quality. 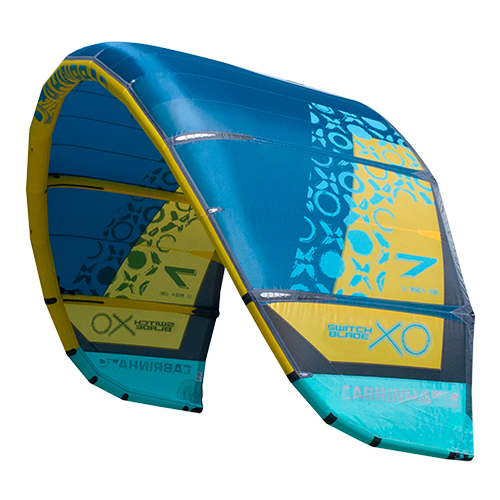 Whether you're boosting big air, throwing down technical tricks, or simply out for a fun session on your own terms, the Switchblade provides the ultimate kiting experience.